Intercomp offers fully automated testing stands to make the calibration process as simple as possible. They also offer portable Low Capacity Manual Test Stands which features a digital readout for force and travel and rates springs up to 2" in diameter or medium springs up to 6" in diameter. Easily and efficiently assess product performance to verify inventories are meeting specification with this portable test stand, featuring a digital, AC powered, NTEP approved indicator and load cell. Accuracy is up to ±0.25%, with a capacity of 25,000lbs (13,500kg), 8" (203mm) Travel, and sturdy steel construction, this test stand is the perfect addition to any test application. The precision load cell and indicator ensure all testing is completed to the most exacting specifications. Intercomp’s Automated Test Stands allow detailed testing for accuracy and offer the convenience and peace of mind of onsite instrument testing and verification. Stands feature up to 8" (203mm) on 60,000lb (30,000kg) Models & 9" (229mm) on 100,000lb (50,000kg) Models Working Clearance between the surface area & load cell and the overall surface area measures 45.5"x54.5" (1,156 x 1,384mm). These systems have been purchased by various worldwide maintenance organizations for calibrating a vast variety of scales. The calibration software communicates with Intercomp scales allowing closed loop control of the calibration points, auto sdjustments and verification. The verification process is programmable, allowing the development and implementation of existing internal calibration processes. Reports and certificates are generated, saved and can be recalled at any time. With an accuracy of up to ±0.025%, and capacities to 100,000lbs (50,000kg), the load cell and indicator provide the necessary accuracy to comply with the internationally recognized standard for accuracy & traceability. Manual Test Stands will meet your most exacting compression and tensile force measurement needs and offers the utmost in product life-cycle management. This floor mounted, high capacity, test stand features a digital, AC power, NTEP approved indicator and load cell. With an accuracy of up to ±0.025%, full capacity range of up to 100,000lbs (50,000kg) and sturdy steel construction, this test stand is the perfect addition to any test application. Intercomp’s portable Low Capacity Manual Test Stand features a digital readout for force and travel and rates springs up to 2” in diameter. 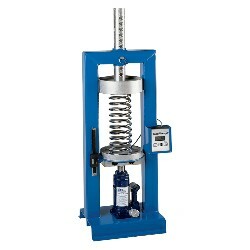 Intercomp’s portable Medium Capacity Manual Test Stand features a digital readout for force and travel and rates medium springs up to 6" in diameter.